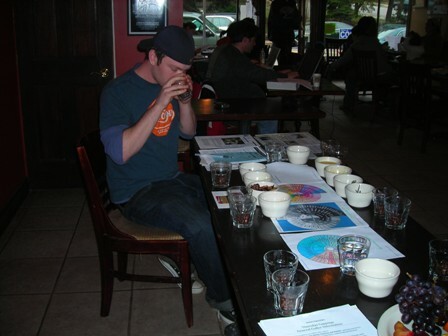 This is Braden(click here to see his profile) getting ready to lead our Thursday cupping. You might question why I titled this Thursday’s cupping as “Lead rather than follow” and what’s that got to do with aroma, body and flavor? It’s because I led the 1st cupping and since then the baristas at Tazza D’Oro have continued to raise the bar and I’m glad I’m not up next. Phew! Our baristas cupping acumen has been fun, incredibly creative and informative. Their passion for the coffee and their eagerness to learn and to do the research has been inspiring. Once again, thanks to Aaron at Batdorf and Bronson for all your advice, time on the phone, and great ideas. Aaron, we need a picture of you, btw. Braden featured two amazing coffees today – El Salvador Siberia Pacamara and Costa Rica La Minita del Sol (coffee report). Both coffees are classified as relationship and shade grown. In the picture, the coffee closest to you is the El Salvador Siberia Pacamara. Braden featured his own mixture of mulling spices – orange and lemon peel, nutmeg and clove to help us identify all the luscious aromatics of this coffee. 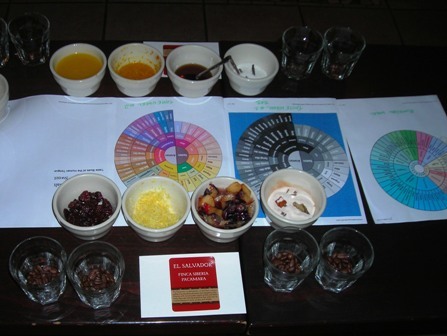 He also presented dried raisins and some fresh fruit that really helped us pick up the flavors as we slurped the coffee. We found this coffee to be full bodied, complex and we loved how the spices and fruits came together. If you come in to buy this coffee, please ask to see the beans – they are larger than most coffee beans and the taste in the cup will also be as big. On the far side of the picture are the cups featuring the Costa Rica La Minita del Sol. I don’t know if it gets any better than this coffee. Personally, I haven’t had it in a while and today I said “I want to drink this coffee everyday for the rest of my life!” With the La Minita, Braden featured freshly squeezed OJ, orange zest, real maple syrup and real vanilla beans mixed with sugar. This coffee features beautiful acidity -citrus – and a luscious sweetness and smooth body. To top it all off, Emily whipped us up a batch of buttermilk pancakes. 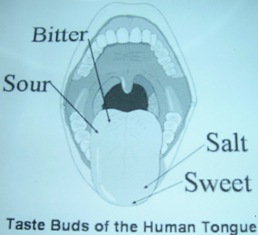 Braden also featured some visuals on the cupping table that included a picture of the tongue featuring the 4 basic taste buds and location for sweet, salty, sour and bitter, a flavor wheel and aromatics wheel and body (mouthfeel) wheel. Zach is up next Thursday, April 3rd. Please join in. We start our cuppings at 4:30 pm and they usually last about 45 minutes. We also feature samples of our “cupping” coffees at the espresso bar from 5:30 pm to 6:30 pm. Braden is a great teacher. The use of visual aids is a wonderful technique. I'm happy to see this feature. And I wish I were there to taste these creations. Keep up the good work. Braden's Mom and Rachel's Stepmom.